Montgomery County, Maryland is located in the Washington suburbs. During the twentieth century, Montgomery County grew from a diffusely developed rural Southern agricultural area into one of the wealthiest counties in the United States. Its history of racially restricted residential subdivisions, Jim Crow dominated commerce and public spaces, and network of rural African American ghettoes has been mostly erased and rendered invisible. Published histories, designated historic sites, and commemorative landscapes privilege the stories about wealthy white community builders while omitting, marginalizing, and distorting narratives about Montgomery County’s people of color. Invisible Montgomery and its partners are working to educate residents, community leaders, and visitors about Montgomery County’s complicated histories. 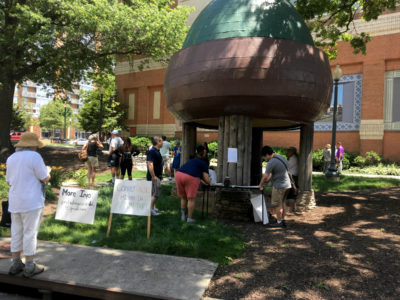 By offering tours such as the Silver Spring Black History Tour, public programs, and networking events, we are asking our neighbors to interrogate their surroundings and the histories they encounter. Through direct action events and advocacy, we are encouraging positive changes in official placekeeping efforts and historic site designation and interpretation.